It has recently come to my attention that Cold Sesame Noodle ™ are not, in fact, a staple of take-out Chinese restaurants everywhere. All of them have beef and broccoli. Orange chicken is a consistent option. Lo Mein? Why, of course! But I swear to you, there is not a single Chinese restaurant in the entire state of Connecticut that serves my very favorite dish: cold noodles, softly dressed in a not-too-sweet-not-too-salty peanut sauce. I discovered this lack on a Saturday night when some friends and I decided to order Chinese food. I scanned the menu of Asian Restaurant, the creatively named eatery on Broad Street, and found none. We pulled up the menu for China King and scanned the appetizers. Once again, no cold noodles. Other friends chimed in, admitting that they, too, were unfamiliar with the supposedly signature dish. This is when I realized that I may have been wrong about the cold sesame noodle all along. I used to think Chinese restaurants were sort of like diners in their steadfast accountability. From one diner to another, the menu may vary—but not by much. The staples are consistent: eggs, pancakes, BLTs. The great cold sesame noodle debacle of 2019 at first made me believe that outside the state of New York, diners have no eggs, so to speak. But I soon began to wonder if the noodles aren’t like the eggs: Maybe my understanding of cold sesame noodles as THE classic Chinese take-out order is misguided; maybe, in reality, it’s merely regional cuisine. I feel bad for other regions. The next day, while feeling thoroughly dissatisfied with the “Chinese food” I had eaten the night before, I remembered that I had volunteered to cook house dinner, a Sunday tradition in Earth House. Brilliant, I thought: I will make the damn noodles myself. This was the very first recipe that I actually made up from scratch, using only my tastebuds’ lasting memory and my imagination to create my very own cold sesame noodles. Last night was the first time I used actual measurements to make the sauce, and it was all for you, the faithful readers of The Argus. Cook the noodles according to the instructions on the package. 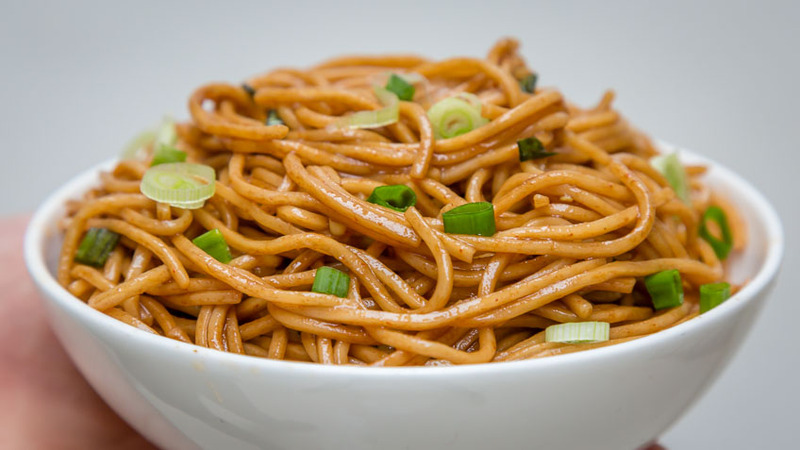 While the noodles are cooking, put the peanut butter, rice vinegar, sesame oil, soy sauce, and sugar in a bowl, and mix them together. At first it may seem like the peanut butter isn’t keen on blending with the other ingredients, but I promise, if you use a fork to stir the mixture and use just enough passion, it will work. When the noodles are done and the sauce is smooth, mix the two together and voila! I believe they are best when eaten cold, but clearly my perception of what Chinese food should be is slightly off, so I suppose you can eat them warm if you’re into that kind of thing. You can top off the noodles with chopped scallions or peanuts, fried tofu, or even an egg! Bon Appetit!